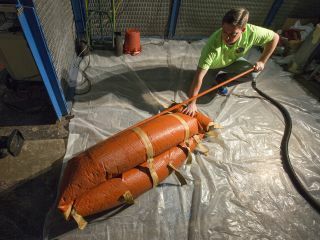 A 9-foot (3 meters) test article for an inflatable heat shield gets packed tightly by engineer Sean Hancock. An inflatable-heat-shield prototype designed to protect spacecraft on other worlds has passed its first key step: making sure it fits into a rocket. In a recent test, the 9-foot-diameter (3 meters) test shield was carefully compressed to see how it would respond to the folding and packing. By studying the doughnut-shaped heat shield tech, engineers hope to better understand how the material will behave when it automatically deploys during a future deep-space mission. The eventual goal for the inflatable technology, called the Hypersonic Inflatable Aerodynamic Decelerator (HIAD), is to use atmospheric drag to slow down a spacecraft. This will lessen the heat the spacecraft experiences while entering a planet's atmosphere, and will help the spacecraft land more gently, according to a NASA description. An artist's illustration of a Hypersonic Inflatable Aerodynamic Decelerator (HIAD) heat shield deploying during a descent to Mars. This technology could help people (in a heavy spacecraft) land using the thin atmosphere of Mars, or even return cargo from the International Space Station, NASA HIAD project officials said in the statement. One key barrier to a human Mars mission is how to land the heavy cargo required to support a crew of astronauts for weeks or months. If this test and others are successful, NASA will build a larger HIAD that can pack into a rocket and deploy safely to bring a spacecraft safely to the ground. Engineers at the NASA Langley Research Center prepare an inflatable-heat-shield test for packaging. "All these tests build on each other to help demonstrate the performance of the system," Johnson said in the statement. "In the end, we'll have a complete system that will be tested, to show that it can meet the requirements for a spaceflight mission, whether it's going to be returning a vehicle to Earth or future Mars missions."